Memory foam mattress toppers have been all the rage in recent years and many different companies have been cropping and have started to produce their own variants making it all the more difficult for already bewildered buyers to find the best memory foam mattress topper for them. In this article, we hope to enable you to go forth with more confidence and buy the right memory foam mattress topper for you. Mattress toppers serve a great function. They are designed to enhance sleeping comfort. Placed over a firm mattress – or a mattress that has lost its cushioning, a plush topper can efficiently give an old bed a makeover and make it feel softer. And if your mattress feels too soft for you, you can simply put a firm topper over it to get more support. Mattress toppers also serve as a barrier to protect the mattress from stains and allergens. With a mattress topper, you won’t have to replace your mattress sooner than you need to. Mattress toppers vary in thickness, density and materials used. One of the most popular mattress topper materials is memory foam. It’s interesting to know that memory foam didn’t make its way into beds right away. First developed for NASA in the ‘70s, memory foam has come a long way from making astronauts more comfortable as they rode off into space to making us comfortable as we went off to sleep. Memory foam is popular because of its ability to mold to the shape of the object placed upon it. This quality makes memory foam a top choice of material for mattresses and mattress toppers as it contributes to pressure point relief, an even distribution of body weight, better spine alignment and improved blood circulation, helping you get a more restful, pain-free and restorative sleep. Mattress toppers that make use of memory foam are also great when you’d like to experience sleeping on memory foam but don’t have the budget for a memory foam mattress. You can simply purchase a mattress topper made of memory foam and place it over an innerspring or latex foam mattress. This would create a hybrid bed that combines the supportive properties of spring or latex mattresses with the comfort-giving and body-contouring qualities of memory foam. Here’s all you need to know about memory foam bed toppers to help you decide which one to pick when you go shopping. Two major types of memory foam toppers exist today. The first one uses traditional memory foam and the second one has gel infused in it to create a cooling sensation. The first type may have a single layer of memory foam or it may have two layers of foam of varying densities. The top layer of memory foam molds to the body while the bottom layer of high-density foam provides support to relieve pressure. The second type, the gel-infused memory foam topper, is designed to address the problem of heat retention in traditional memory foam. The gel in the memory foam works to diffuse the heat coming from your body so that you sleep cooler and more comfortably. Technology has allowed us to shop for products anywhere we want. With the benefits of convenience, secure payment options, quick sources of information and the ability to shop anytime, it’s no wonder that shopping online has become the activity of choice for many people. Of course, when it comes to buying the best memory foam mattress topper, going to a brick and mortar store also has its benefits, including the ability to test different products yourself. So, should you buy online or in a store? The following factors can help you decide on the best course of action. Feel of the memory foam mattress topper – You won’t be able to know how a mattress topper feels unless you go see it for yourself. If you don’t want to go through the hassle of returning or exchanging a bed topper you bought online because it wasn’t quite what you were looking for, it would be best to visit a retail store. Bring your spouse, partner or friend along so you won’t feel too uncomfortable with lying down on showroom mattresses topper surrounded by overly attentive salespeople. 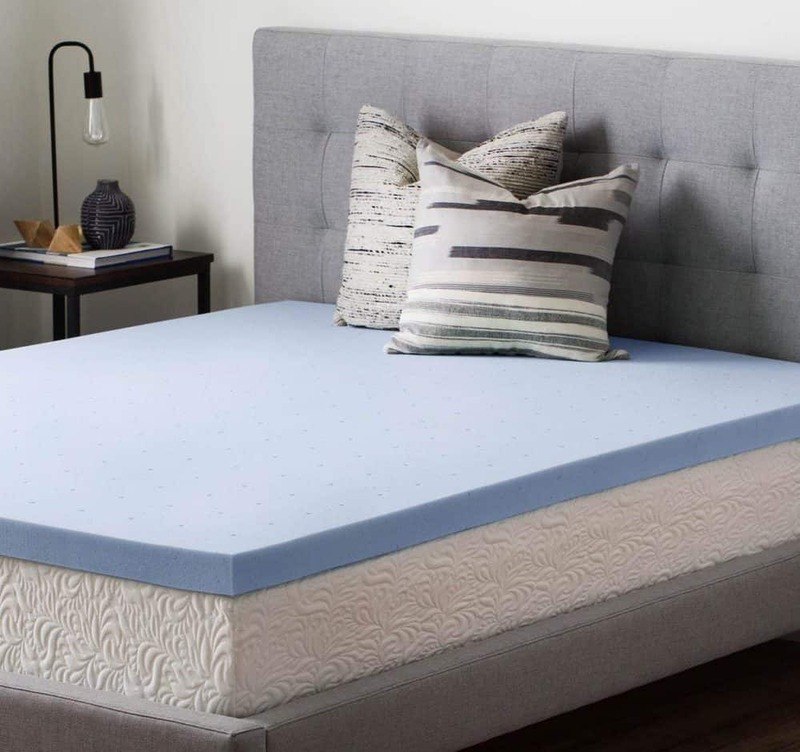 Options and availability – A quick online search will give you an idea of just how many mattress toppers you can choose from, from memory foam and gel-infused memory foam to latex and feather-filled toppers. Availability is rarely a problem too because you can also buy from the manufacturer directly. Buying in a store means you can only choose from what they have on hand. Then again, some people prefer choosing from a few rather than being overwhelmed with a variety of options. Time – This one’s a no-brainer. If you have the time to go to a retail store to check out bed topper made of memory foam, then do so. If you can’t quite fit a visit into your schedule, just do your research and make your purchase online. Price – You can save money when you buy a mattress topper online when you use discount codes and compare prices among retailers. Companies that follow an online business model also tend to put a lower price tag on their products. Offline, you would need to haggle or ask the store if they would be open to matching the price posted online. Those are the key considerations you need to think about when choosing to buy the best memory foam mattress topper online or in a store. A good plan is to do your research online to narrow down your options, then look for a store that sells those models (or similar ones). Visit the store and try the toppers out so you can have a better idea of how they feel, then negotiate the price. If the store is unwilling to match the online price, then just purchase the topper online. When it comes to the feel of the best memory foam mattress topper for you, know that what may feel too soft or too firm for you may be just right for someone else. It’s highly subjective. If you’re not too picky however, you can opt for a memory foam mattress topper with a medium-firm feel. Toppers 3 to 4 inches thick would fall under this, which is often considered the middle ground and the best option for people who experience back pain. Memory foam tends to trap heat because of its high foam density and decreased ability to circulate air. This can make you sleep hot and uncomfortable, especially if you sleep in a warm room or during the months when the Earth is closest to the sun. It’s a good thing that manufacturers have come up with ways to reduce heat retention and dissipate heat in their memory foam toppers. These include using gel, as mentioned earlier, and putting ventilation holes throughout the topper to allow for the circulation of air. If you’re particularly sensitive to heat or live close to the equator, the best memory foam topper for you is one that has a tried-and-tested cooling technology. When you first set up a new memory foam bed topper, you may notice a particular odor coming from it. This odor is a mixture of gases that the chemical compounds in the memory foam release over time. Off-gassing is the natural process of releasing these gases. Some mattress toppers take only a few hours to off-gas, while others may take a couple of days for the odor to become less noticeable. Well-built mattress toppers made of durable, high-quality memory foam last longer. How a mattress topper is structured or constructed can also make a difference in your overall sleeping experience. Aside from cooling technology, there are other features you need to consider when buying a memory foam mattress topper. These are thickness, density and ILD, or indentation load-deflection. The thickness of memory foam toppers range from an inch to 4 inches, with the thinner toppers providing medium firmness and the thicker ones being the softest. The most popular ones are those in the middle – the 2-inch and 3-inch toppers – because they’re usually “just right” for most sleepers. When it comes to density, memory foam toppers with 3.5 to 4 lbs of density usually have a good mix of comfort and support. In a dual-layer mattress topper, the densest layer is placed at the bottom to provide the best support while the layers with the lowest densities are placed at the top for comfort. High-density memory foam is usually more expensive but it lasts longer than low-density foam. ILD is an indicator of the amount of pressure required to create a significant indentation on the surface of the bed topper. Memory foam with a high ILD number is more firm and can withstand a greater amount of pressure than foam with a lower ILD rate. When looking for a mattress topper that uses memory foam, take a look at the various layers (if there’s more than one) and their foam densities and ILD range, as these would affect how soft or firm a bed topper is and how resistant to compression it would be. The density and ILD should be just right according to your needs, taking into consideration the condition of the mattress it will be placed on, your weight and personal preferences. The best memory foam mattress toppers may be a lot less expensive than a memory foam mattress, but it’s still a significant purchase so it’s very important to choose wisely. Sometimes however, even with hours of research and a few minutes of topper-testing in stores, you may still end up with a product that falls short of your expectations. This is where companies offering a risk-free trial period and an easy way to return or exchange items shine. A trial period, which can last anywhere from half a month to a full year, lets you see if a particular memory foam topper works for you on a long-term basis. It may have felt awesome when you first tested it out in the store, or it seemed like a match made in heaven during the first few days of use. But soon you began to feel uncomfortable like you’re sinking too much, or sleeping too hot. If it’s still within your trial period, you can arrange for a refund or have the topper exchanged for another model. Return and exchange policies may differ among brands however, so make sure you read and understand the fine print. The same goes for the mattress topper warranty, which covers manufacturing defects and physical flaws that may cause the memory foam material to crack or split. This means that even if you have a lifetime warranty on the topper, if it begins to sag after the second year because of regular use, you would have no choice but to get a new topper – or a new mattress. Bad customer service can be a deal breaker. Other than their products, memory foam companies are also rated according to how helpful their customer service department is, especially when it comes to providing more information about products, accommodating refunds and having items replaced. A company that puts customer satisfaction first before profit is sure to win repeat customers as well. If you’re on the hunt for the best memory foam mattress, don’t hesitate to talk to a customer service representative about any concerns or to clarify issues regarding refunds and product returns. You can also ask other consumers about their experience buying from a particular company, any problems encountered and what the company did to address the issue. Product reviews provide consumers with an in-depth look at the specifications, features and pros and cons of an item. If you’re having a hard time choosing from several memory foam mattress toppers you can take a look at reviews to give you a better idea of which one would best suit your needs. You can also check out comments and reviews from users who have purchased the same memory foam topper you’re considering to see what they think about it. It’s important to take them all with a grain of salt however, as some views can be subjective especially when it comes to comfort. Still, these reviews can provide you with useful information such as how helpful a company’s customer service is, their return and exchange policy, speed of delivery and mattress topper quality. The best quality at the least cost – that’s what you want when considering value for money. Mattress Topper A and Mattress Topper B may have the same specifications and features, but Mattress Topper A costs $300 more. In this example, it’s clear that Mattress Topper B gives you more value. Price and product comparisons, along with reviews, can help you determine if a particular memory foam mattress topper is worth a lot more than its price tag. With the number of different memory foam bed toppers available today, you’re sure to find the best memory foam mattress topper that would seem to be made just for you.